It Is Legal For Kids To Work On Tobacco Farms, But It Can Make Them Sick Advocates say that gaps in federal regulations leave child workers vulnerable to the health risks of nicotine and pesticide exposure. Labor laws allow larger farms to hire kids as young as 12. 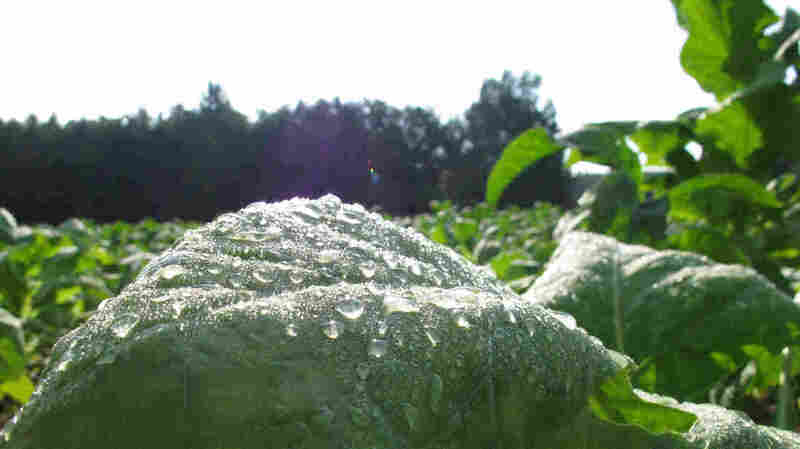 Morning dew glistens on a tobacco leaf in a field outside Rolesville, N.C. Despite a worldwide decline in production, tobacco remains North Carolina's most valuable crop. The Fair Labor Standards Act, which governs child labor, makes exceptions to child labor laws for small farms and allows hires as young as 12 for larger ones. During tobacco picking season, some of the smaller farms in North Carolina will hire kids as young as 7 years old, says Melissa Bailey Castillo, outreach coordinator at the Kinston Community Health Center in Kinston, N.C.
Tobacco farmers say they need the extra labor, especially during harvest season, and in rural North Carolina, kids say they need to work to help support their families, according to a study by Human Rights Watch. But child worker advocates like Castillo say that loose U.S. regulations and tobacco industry policies have left these kids vulnerable to the health risks of nicotine and pesticide exposure. "It's kind of a legacy in eastern North Carolina," Castillo tells Here & Now's Robin Young. "Either your neighbor owns a farm, or a relative owns a farm. Tobacco obviously is part of that heritage, and kids have been working in it, farmers will tell you, for generations." While the U.S. government has acknowledged the risks of tobacco farming, it's still legal for kids at age 12 to work on a tobacco farm of any size with parental permission, and there's no minimum age for children to work on small tobacco farms or those owned by family. In 2015, Human Rights Watch interviewed 33 children, ages 13 to 17, who worked on tobacco farms in North Carolina. Nearly all of the children interviewed described experiencing symptoms of nausea, vomiting, headaches, dizziness, skin irritation or respiratory symptoms either during or after work. "I [still] get headaches and ... my stomach hurts," 16-year-old Elena G., who has worked in tobacco fields since she was 12, told Human Rights Watch. "And like I feel nauseous. ... I just feel like my stomach is like rumbling around. I feel like I'm gonna throw up." Castillo explains that many people who work with this crop will develop what's called green tobacco sickness. "This nicotine is absorbed through the skin," she says. "It's not unusual that by lunchtime, you're throwing up, you're vomiting." Castillo says many kids don't know how to protect themselves from nicotine poisoning, and they often don't wear gloves because they tend to tear the tobacco leaves. Human Rights Watch reported that most of the kids they talked to had never even heard of green tobacco sickness. Federal regulations also require access to handwashing facilities and toilets, but most of the children who spoke to Human Rights Watch said they lacked access or it was very limited. Human Rights Watch also found that many kids weren't notified when their employers sprayed pesticides in the field, even though EPA regulations prohibit child workers from handling pesticides and other toxic chemicals. Castillo says there is a lot of secrecy surrounding children working in tobacco fields. When kids show up at the doctor with symptoms of nicotine poisoning, they often won't tell the doctor they had been working on a tobacco farm. Since publishing an initial report in 2014, Human Rights Watch says some tobacco companies have reviewed and updated their policies on child workers, but enforcement on actual farms is still a challenge. The U.S. government has also struggled to strengthen regulations for children working in the agricultural industry, which is treated differently than other industries under the Fair Labor Standards Act. In 2011, the Department of Labor proposed an update to the list of agricultural jobs dangerous for children, but it dropped those recommendations after pushback from farm lobbying groups, such as the American Farm Bureau. "Farm Bureau advocates for the interests of farmers," the American Farm Bureau said in a statement to Here & Now. "Our policies are set out by our delegates — everyday agricultural producers who are very proud of their heritage. We are not in the business of protecting, promoting or prosecuting bad actors." Castillo says that farm lobbying groups claim that regulating child workers destroys the fabric of American farms, which are run by families. But she says most farms that rely on child labor are not small, family-run operations. "The farms impacted most by child farm workers, they were enormous operations, corporate farms," Castillo says. "It was not a matter of the Smiths down the road employing children through a contractor — that was rare, if at all." Regulations need to be stricter and enforced, she says, because it's not just a couple kids out there working in the tobacco fields of North Carolina or in other states with large tobacco sectors. "The last summer that I was out doing a count, I stopped at 100 kids in two counties — that's just who I found," she says.